Our staff is dedicated to caring for the whole child. We have experienced professionals who have supported the Clinic for many years. These professionals go beyond treatment by placing a strong emphasis on prevention and health education. 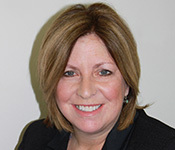 Peggy LaFleur is a 25 year resident of Oak Park and received her Bachelor’s Degree from UIC; a Master’s Degree in Health Administration from UIC and a MBA from Boston College. 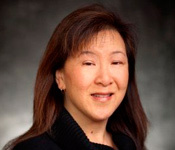 She is fluent in Spanish and has considerable healthcare management, fundraising and marketing experience. Her passions include reading, traveling to Latin America and Ireland, gardening and her dog Kennedie. Dr Halac is Board Certified in Pediatrics. 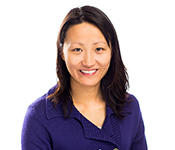 She completed her residency in Pediatrics at UIC, and Pediatric Endocrinology Fellowship at Children's Memorial Hospital. She is pursuing her MBA in Healthcare Management at George Washington University. She enjoys reading and spending time with her husband, son and twin nephews. PhD Loyola University – Chicago, IL,MSN Wayne State University – Detroit, MI,MPH University of Michigan – Ann Arbor, MI. I have worked at the clinic for 8 years. Experience with pediatric hematology/oncology, adolescent health, and primary care. I enjoy staying active - biking, running, reading books, and spending time with family. 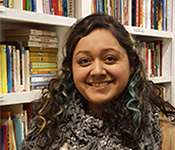 Angelica enjoys working in healthcare and practicing compassion and attentiveness with all children. Dental Degree from University of Illinois at Chicago. Earned a Masters in Public Health at the University of Illinois at Chicago. 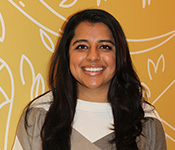 Has worked in a community health setting for over 10 years, lives in Chicago and enjoys running. 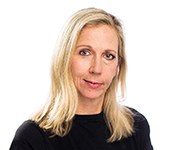 DDS, University of Illinois at Chicago, works in private practice and at Children's Clinic since 1997. Teaches at the College of DuPage. She lives in River Forest with her husband, has four sons and enjoys travel, biking, hiking, and yoga. Received her B.S. at St. Olaf College and her DDS from UIC College of Dentistry. She served in the Army Dental Corps for ten years and has enjoyed working in public health for the past nine years. She keeps very busy with her three children. 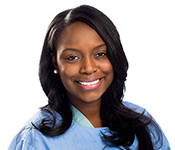 Dr. Dillard grew up in Evanston, and did an externship at the Children’s Clinic before she graduated from UIC. She then went on to specialize in Pediatric Dentistry. Her husband is also a dentist, and their favorite thing to do in their free time is travel, get together with family and eat out! 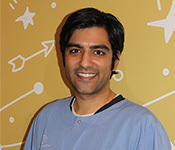 Dr. Patel has a Certificate in Pediatric Dentistry from the University of Illinois at Chicago – College of Dentistry and is a candidate for the Doctor of Dental Surgery. 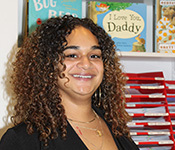 She treats kids of all ages and backgrounds, and she has a passion for working with children who have special needs. 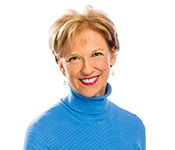 Her philosophy is to focus on preventative therapies and to counsel families on how to improve oral health with changes in nutrition and oral hygiene habits at home. Dental Degree from Indiana University in Indianapolis with a BS in Biology from the University of Nebraska at Omaha. Dr. Karimzadeh enjoys running and his favorite childhood book is Harry Potter. Dee has worked in dentistry for 25 years. 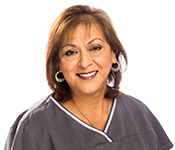 She is a member of the American Dental Hygienist Association and the Hispanic Dental Association. She has a talent for decorating cakes. Kim works with our Portable Dentistry Program. She has worked in Pediatric Dentistry since 2001. When she was young, she enjoyed playing with her Cabbage Patch Kid, Cabby. Today she enjoys playing with her niece and nephew. 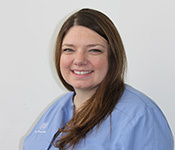 Elizabeth is a Registered Dental Assistant and also works at the clinic at front reception. One of her favorite books is the Catcher in the Rye by J.D. Salinger. In her free time she enjoys running with her dog. 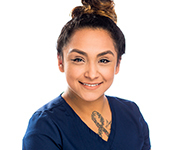 Gladys is a Registered Dental Assistant, who graduated from her program with honors. When she was a little girl, she liked Barbie and reading the Junie B. Jones series of books by Barbara Park. 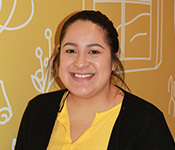 Lisbeth grew up in the town of Cicero and started working in the clinic in December of 2017. Her hobbies and interests are dedicated to music and dancing, but also enjoys volunteering at her Parish, and helping others in any way/form needed. 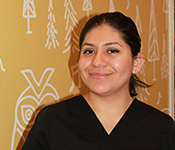 Marisol has been a Dental Assistant for more than 8 years. She enjoys working with children, movie night with her family and reading a good book. 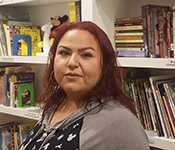 She received her Master's Degree in Social Work from Loyola University with an Undergrad Degree in Social Work from Northeastern Illinois University. She has 10 years of experience working with children and families through a variety of life changing situations. She enjoys volunteering in the community and being active doing other things she loves such as fishing, yoga, and running. Masters Degree of Social Work from Loyola University. 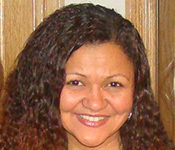 She has experience as a school social worker, a psychiatric social worker, and a member of the Peace Corps in Brazil. Her favorite children’s book is The Polar Express by Chris Van Allsburg. 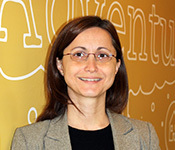 Maria has a master's degree in Social Work from Loyola University Chicago, with focus in Children and Families. She has been providing compassionate social work services in different settings in many Chicago communities. 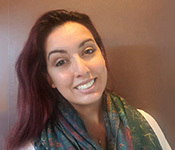 Maria is trilingual (Spanish, Portuguese) and has a passion for traveling with her family, having meaningful conversations with others, and enjoys the rich music scene of Chicago. 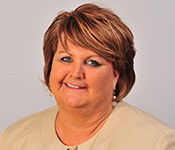 With nearly 20 years of experience in the healthcare industry, Betty brings a wealth of knowledge to our clinic. She enjoys being healthful and active and loves to visit the beach. 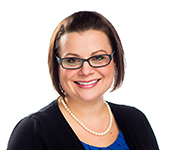 Clara has more than 8 years of experience in healthcare administration. 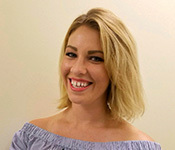 She likes working with people and interacting with patient families to provide help. She is also a hair stylist and enjoys spending time with family and watching movies. 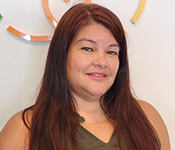 Luz has more than six years of customer service experience and enjoys helping families at the Clinic. She likes to exercise and work out at the gym and spends much of her free time at the ranch so she can be with the horses. 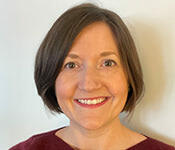 Lynda earned a MA in Grant Writing, Management & Evaluation from Concordia University Chicago and a MA in Sociology from UIC. 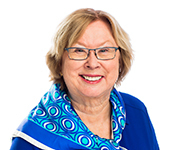 Lynda serves as the VP on the Riverside District 96 school board. She enjoys time with her husband and sons watching LOTS of sports. Eva earned her Bachelor’s Degree in Accounting from the University of Negros Occidental – Recoletos. She has worked in Accounting & Finance over 20 years. ) In October 2017 she gained her Professional Biller Certificate from the American Academy of Professional Coders. She likes to travel, especially to destinations with relaxing beaches. Victoria coordinates the portable dentistry program that brings free dental exams to schools in the community. She is certified as a health education specialist with a degree in health education from Illinois State University. She enjoys long distance cycling, visiting new places, and playing with her cat. Over 20 years marketing and nonprofit management experience. Earned a MBA degree in March 2013. Undergrad degree from University of Notre Dame in American Studies. She enjoys spending time with her daughter Colleen, and visiting Chicago parks with her shitzapoo. 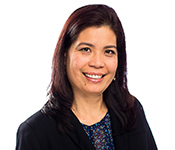 Solimar has over 4 years in healthcare administration. She enjoys volunteering for her church daycare and to help feed the homeless. Many days you can find her watching her brothers play baseball. 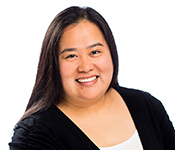 Jienica is originally from the Philippines moved to the U.S. to further her education. She has a Master’s Degree in Accounting at Keller Graduate School of Management and is working on earning her CPA license. She loves to spend time with her family, to read books, and play video games. 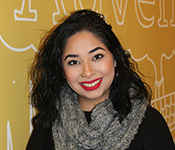 Yesenia enjoys working with people and has worked in customer service for over five years. She enjoys listening to music and spending time with family and friends. 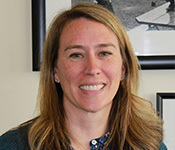 Kristin has a strong, mission-driven non-profit and fundraising career that spans 18 years work for causes close to her heart and with a fondness for individual and major giving. 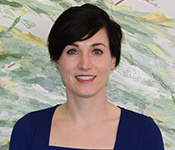 She loves the idea that philanthropy helps people live their values and is excited to connect with and inspire more people to support the IWS Children's Clinic. She lives in Oak Park with her husband Joe, 8-year-old daughter Matilda, 2-year-old son R.J., and their Beta fish Josh. Graduate degree In Accounting from University of Illinois at Chicago. Over 12 years’ accounting and finance management experiences. Specialized in healthcare and managed care field. Love to spend time with two boys and family. Hobbies include biking, tennis and reading. 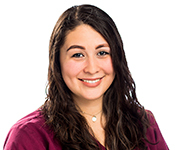 Alexis Witkowski earned her Bachelor of Science in Public Health from Northern Illinois University and is currently working towards a Master of Public Health in Health Policy and Administration from the University of Illinois Chicago. 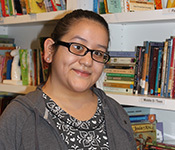 Alexis has worked almost 10 years in community health. 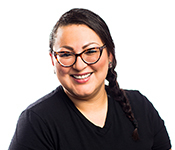 Outside of work, Alexis enjoys spending time with family and trying new recipes.